I realize that the world in general is hardly in the mood to hear news about any more terrorist attacks. But at least this was one that was thwarted. 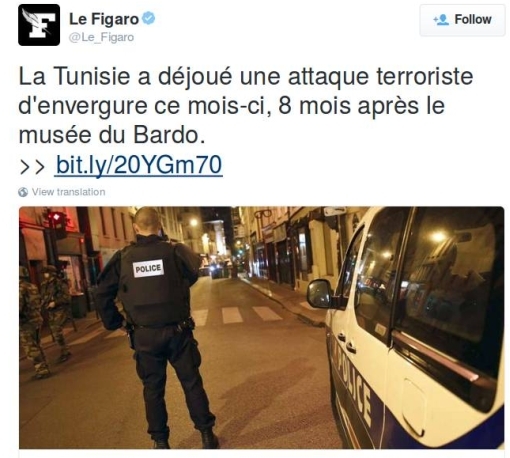 “Tunisia foiled a large-scale terrorist attack this month.” So at least announced today that government’s official in charge of security, Rafik Chelli. He claims they did so by discovering and breaking up a 17-man jihadist cell which was planning to execute a coordinated attack on hotels, security installations and politicians, “in order to sow chaos in the country.” Some of these people were said to have been trained in Libya – the country directly to Tunisia’s East – and some in Syria. But if a bomb goes off, or a bullet is fired, in the Middle East these days, will people elsewhere necessarily care? You might have heard that ISIS suicide-bombers killed 40 at a South Beirut open-air market just the day before the Paris Attacks – or, likely, you may have not, as Paris soon overshadowed everything. It’s a shame, as the Beirut attack featured a heroic Lebanese man, Adel Tormos, who tackled the second suicide bomber and thereby gave up his own life to save those of many others, including his daughter.